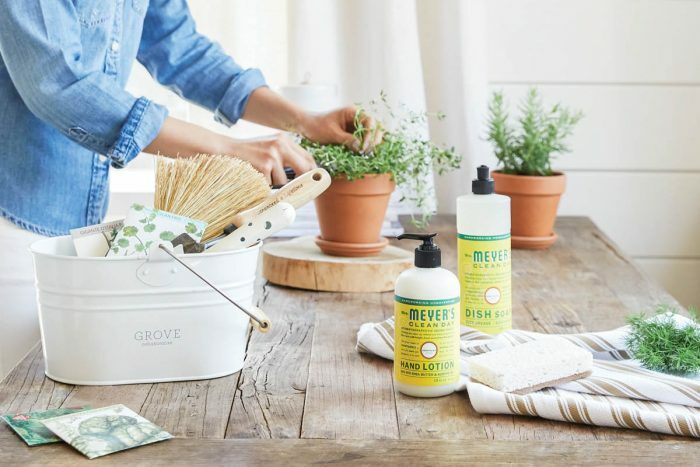 It’s also why I’m so excited to share this free offer with you: When you place your first order of $20 from Grove Collaborative using my link, you’ll get this free caddy filled with Mrs. Meyer’s dish soap, hand soap, and lotion — plus free shipping! Here are five creative ways to use your Grove Collaborative caddy, either for yourself or a gift! Low on storage space under the bathroom sink? Create a styling station with your hair dryer, brush, flat iron or curling iron, and products all within reach. I recently added Seed nourishing hair and body oil (which is available through Grove) to my kit, and it’s perfect for taming summer flyaways! Sign up for Grove Collaborative here [http://influencer-tracking.grove.co/SF2jA]. You will receive the caddy for free when you sign up!